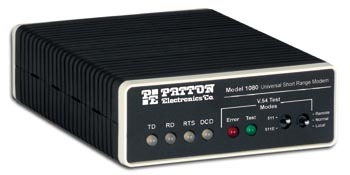 You Can Use the Model 1080A in Just About Any RS-232 UTP or STP Application! The Model 1080A AC Powered, Universal Short Range Modem is the bread and butter of our RS-232 short haul line, and it's now tastier than ever! Recent improvements in the Model 1080A include better distances (up to 17 miles [27.4Km] on one or two unconditioned twisted pair), support for higher data rates (up to 57.6 kbps), and the addition of a built-in V.52 BER test pattern generator.Of course, the Model 1080A retains all the features that you have already come to expect: asynchronous or synchronous RS-232 operation, half duplex communication over two wires or a choice of half or full duplex communication over four wires, support for point-to-point or multipoint applications, and fully compliant V.54 test modes (local analog loop and remote digital loop). Automatic features include equalization, gain control and noise filtering (a separate filter for each data rate is built into a custom VLSI chip). To combat the many nemeses of clear data transmission, the Model 1080A includes surge protection (guards against transients), transformer isolation (eliminates ground looping) and a new anti-streaming timer (stops data streaming). The Model 1080A packs a lot of convenience into a little box: Front panel LEDs give a clear picture of link status, V.54 tests can be activated remotely or via the front panel, and the unit can be externally configured (no need to open the case). Best of all, the Model 1080A standalone is fully compatible with the Model 1080A rack card and the new self-powered Model 1040 short haul.